So I've been hitting the spinning classes like crazy for two weeks. One thing this has done, is make me realize that I don't want to come home and paint...which means that Sunday I will be painting all day. I have one to finish and lots to start...hope you're enjoying what I've been putting out recently. So when I was about 5...6...my mom gave me a necklace with a "C" charm on it. 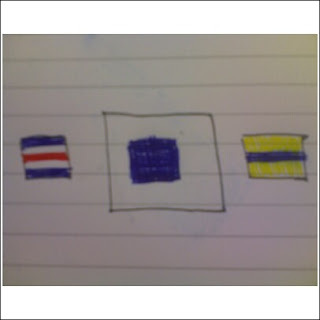 Only it wasn't the letter C, it was a nautical flag C.
I loved it. I also think I lost it. But...it brings me to this. I live in Miami, a city on a peninsula, a city that sits on the Bay and on the Ocean...so how fun would it be to paint Nautical Monograms...or letters for all the boaters out there? I've already sketched mine... I rather like it. The great thing is I can think of several friends who might dig a nautical monogram for their homes. "Ceci, I want to go upstairs to your room and watch Finding Nemo and rest!" Just like that...that's how she asks me. "What if I draw a shark!?" " YEAH!" she says... I honestly had never drawn a shark before. I'm not even a shark fan...shark week scares me...but there I was at her Ikea easel...drawing a shark. 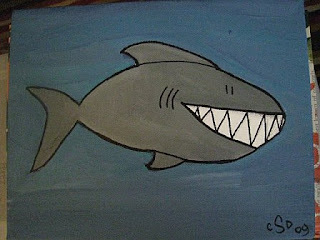 That afternoon-- I came home and brought the shark to canvas life. I'm thinking I know at least one girl who likes it...so there are bound to be others joined by lots of boys perhaps. So today I spent the afternoon finishing two commissions and starting on the summer painting list. First, I tackled the secret commission...it looks awesome, but I can't show you...well because it's a surprise. 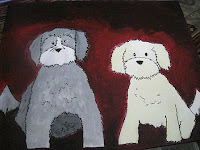 The next commission that I finished was Ginger's dogs, Bailey and Buddy. They are the two cutest little things and I think I did a nice job capturing t hem. They are bossy little things! As you can see it was the normal process, sketch in pencil, then moved on to the first layer of paint- then started on the marker and then another layer of paint and the final marker touches. The picture at the top is the finished product. I can't wait for Ginger to come home to see the boys in all their glory! I also started on the summer painting list... I started Crab Cake and a new one which I was inspired to paint this afternoon after spending the morning with Olivia... Fish are Friends, Here Fishy Fishy, Dah-Nah Dah-Nah ...it's a shark! Tee hee. I'll post pictures of the summer list progress as I continue working on them tomorrow. I also have to go to Michael's tomorrow and buy canvas so I can get rolling on some other things. So, a demain mes amis!! This weekend I am diving deeeeep into painting, so there will be some great and exiting posts coming in the days to come. So I am making a push to get to 40 followers. 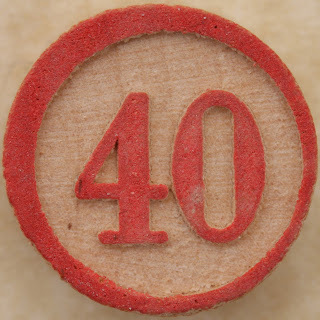 When I get to 40 followers I will take those names and the names of people leaving comments and enter them into a new "Give Away" pool. 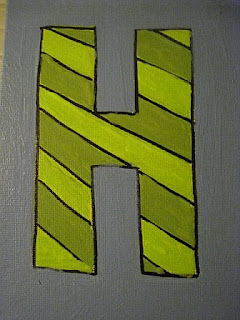 I'll be giving away another personalized mini-letter painting. If one of your simple pleasures is going to museums and cultural programs...and you live in Miami...you need to be concerned right now. It's not too late to do something. Tonight...ACT NOW...email all of the county commissioners and let them know that Arts, Culture and Historic Preservation are important to you...to our community! Tomorrow they will continue their conversation about the budget....and things may get even worse. So the rest of my week in NYC was great. Thursday night we went to PJ Clarke's, where I was the only one to indulge in one of the greatest burgers on the face of this Earth! 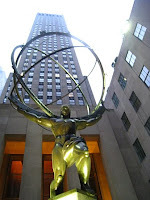 Escape came at 5pm, when we left the hotel and went to Rockefeller Plaza and walked up and down 5th Avenue. Dinner was at the Sea Grill at Rockefeller (YUM! )...we sat outside until it started to rain. The rain left clouds and the clouds meant 0 visibility on the Top of the Rock...so we didn't go up. Instead we went to Times Square and mingled with thousands of other tourists. Saturday we had breakfast at Pret a Manger (YUM!) 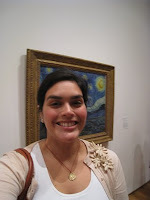 and then made our way to MOMA. After a leisurely stroll through the galleries and gift shop, we popped into the Folk Art Museum gift shop...then cabbed it up to the Met for lunch and taking in of. The Met has a great show called Model as Muse sponsored by Marc Jacobs. It's a beautifully curated show, as most of their Fashion Exhibits are. They also have a new public storage area funded by Luce (like the one at NY Historical) after taking in some galleries we hit the gift shop and then walked over to Madison for my ritualistic romp at Eats Gifts. After that we parted ways and I made my way across the park on foot and over to Broadway to take the 1 up to 110, my old stmping grounds. Miguel met me at Deluxe where I had the infamous BLT (YUM!) and then we went to his place in Harlem...beautiful! We kicked it old school by watching a movie, Public Enemies (very good). After all of that on Saturday I was up for more adventures so I met CB at Bar 55 for a fantastic performance by Sweet Georgia Brown, the last of the Red Hot Mamas ( a must see!! )...we got back to the hotel at 3am. 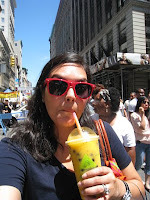 Sunday we romped through Soho via Canal Street and up West Broadway over to Spring to get to Broadway. There was a street festival going on, on Broadway...so we took in the booths, had lunch on the corner of Mercer and Spring...then made out way to the hotel for LGA. That was it...a great trip!! "I wanna wake up in a city that doesn't sleep...I wanna be a part of it, New York, New York..."
So I have been in NYC for 2 days now. It's the first time I have been back since I graduated from Bank Street College of Education in May 2007. 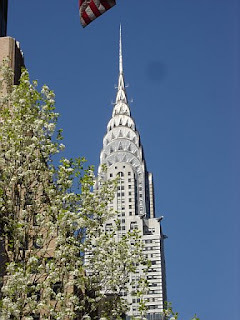 The city is as lovely as ever in her chaotic state of comings and goings. The subways, the cabs, the skyline and hoards of people are making me smile and ready to go and make things happen! 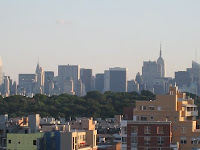 Yesterday we landed and after an adventurous cab ride to 32 & Broadway--- we made it up to the Upper West Side to meet with a friend of mine from BSC and his colleagues at the New York Historical Society. 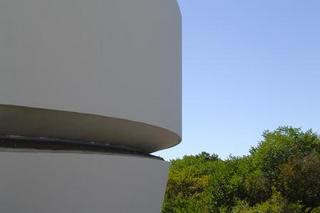 We then walked across the park and up 5th Ave. to visit the Guggenheim, which is celebrating it's 50th Anniversary. Both visits were great for us as we are re branding- expanding and celebrating 70 years in 2010. Dinner last night was at Artisanal (YUM!) ...cheese, soup...and wine of course! Today was quite different. We haven't left the hotel, cooped up in a windowless ballroom talking about evaluations...WOO HOO (not exciting, but useful nevertheless). We will be heading to dinner and then repeating the cycle tomorrow. So...what does this visit mean to CSD Art? Well, I am definitely excited about my Guggenheim and my Empire State Building with Chrysler Building sketches from last fall. I think I am going to do color sketches of them sometime soon and see where they go. In the sketches, The Guggenheim is singing "I Feel Pretty" from West Side Story while in the Empire and Chrysler drawing, Chrysler is confessing to Empire that she is not angry at him anymore for being taller than her. NYC never fails to make things happen! 1. My paternal great-grandfather was en francais...hence my maiden name, Dubon...Dubon Dubon est tres bon! 2. I was subject to taking from from the tender age of 12 to about 16... sacre bleu! 3. 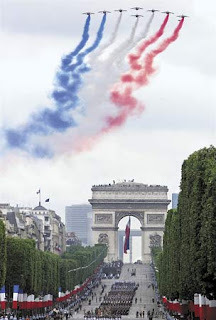 J'aime Paris! 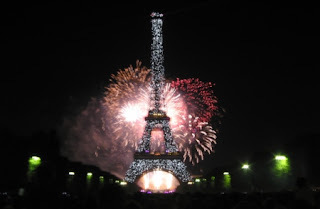 I was fortunate enough to be in Paris on Bastille Day when I was 13...I won't tell you how many years ago that was. So yesterday D and I had a crazy day. We woke up at 8am and drove from Miami to Melbourne, for my friend Marshall's wedding. 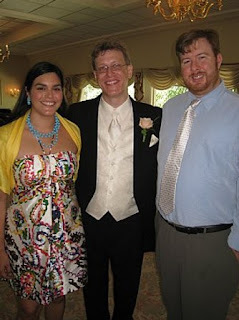 J. Marshall and I met at Bank Street College when we were getting our MS Ed's in Leadership in Museum Education. So in 2.5 hours (suppose to be 3...3.5) D and I made it to Melbourne as the bride was walking into the historic Episcopal chapel they were married in. 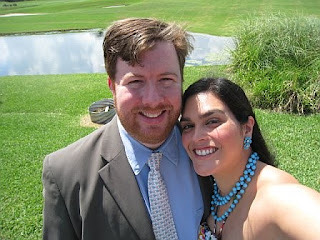 After the wedding, we headed 40 minutes west to Orlando to visit our friend Jeff who just bought a house. After an early dinner...we headed back to Miami. It was a very exhausting day...but a lot of fun and I am really glad we had a mini-road trip. 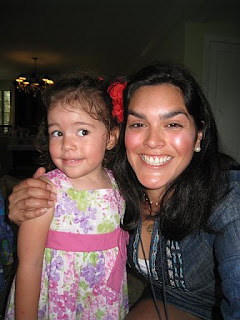 Today was another busy day though...breakfast with the family in the morning at the Riv, and then church...followed by lunch with the communications committee at Le Bouchon du Grove...which was SO MUCH FUN! Free mimosas...a lively crowd, good music and great food! I highly recommend it. After lunch I made it out to Key Biscayne to beach it with mom for a bit before having dinner with friends. A busy weekend...this girl needs a nap. 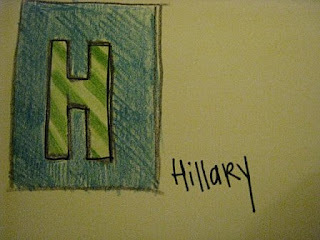 Tomorrow I am going to be mailing out Hillary's "H" and sketching out the secret commission...but I also have to start addressing the invitations to the 4 baby showers I am helping host next month. Will it ever end? ... no...I know it won't...but that's good--busy is good. Busy is usually a healthy balance of work, family and friends...and that is the stuff memories are made of...and this weekend...LOTS of memories made! So after the show--I really want to paint this for the house. 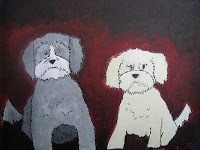 I've painted D and Maggie twice...but I've never painted the three of us. If I did more family portraits like this...how many of you would be into this? 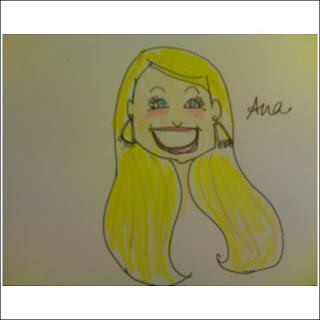 I know my friend Ana wants a portrait of her so the other night I started on a little sketch...and this is what I came up with. 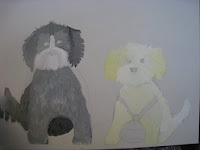 I am also going to work on one of J with her pup Lucy in the kitchen. So there you have it...lots of other little things in the works for after the show. Tonight I am going to begin painting the secret commission...I won't be able to blog about it though--until after it is given...as it is a gift from someone to their significant other for a major event. 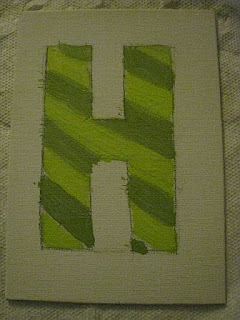 So...last night I started Hillary's mini letter and I finished it up tonight. I took pictures along to way to show you my process. I do the final lines...and VOILA! C'est fini! ...that my friends is how the magic happens. Is it everything you thought it could be and more? 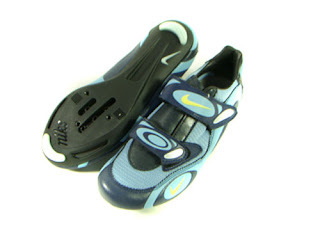 Do you remember being 3? Do you remember being 3? It was 1981 when I was 3...living in Coral Gables. Today was my niece Olivia's 3rd Birthday. Today she negotiates with me as she prepares for the arrival of her kid sister (name to be determined) in September. 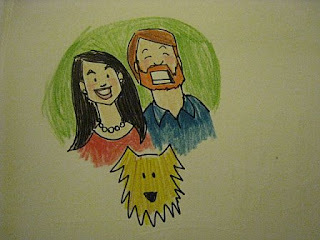 The best part of my relationship with Olivia -- we draw. Oli and I draw and color and draw and color...basically every time I spend time with her...which is a few times a week. 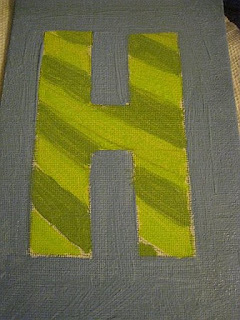 Tonight I am also beginning to work on "H" for Hillary! She has given me artistic freedom with it, which I am excited about. I hope to finish it and have it off to her by the end of the week. 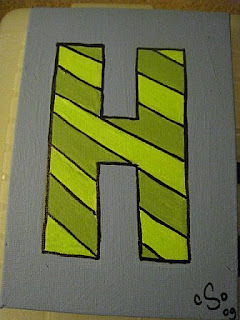 I also got the green light for my secret painting...so that means I get to start that this week too! So...yeah...I will get some work done as I watch 20/20's MJ Memorial coverage from earlier today...on Oli's 3rd birthday. Some days I forget to eat breakfast...not because my stomach isn't reminding me--but because I get into things in the morning and then its "too late"...on days like this...I am ravenous by noon...and come 4pm no matter what I snack on, my head is pounding. 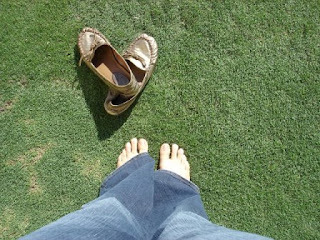 Today was a day like this. The good thing is rather than spending 2 hours at the gym--I came home, made myself a PB&J with honey on wheat bread--then did sketches for a secret surprise commission I am working on. D also pulled a name from my hands for the lucky winner of our first give-away! HOORAH for Hillary in NY!! Thanks to everyone for following and commenting along the way. There will be another give-away soon. Another weekend is over and--that means that we have come to the last night of our first give-away week. I went out to Michael's today and got the cutest little canvas to paint the prize for our lucky winner. Tomorrow night I'll make the announcement. Until then...be good and thanks for the support. So, I grew up spending the majority of my weekends on the beaches of Key Biscayne. I am a beach girl...though I stay under and umbrella and wear an SPF 50 hat and put on SPF 45...I love the beach. I love the smell of it, the feel of it, the sound of it...everything. I think that is why I like to paint beachy things...from sea grape trees to crabs and starfish. 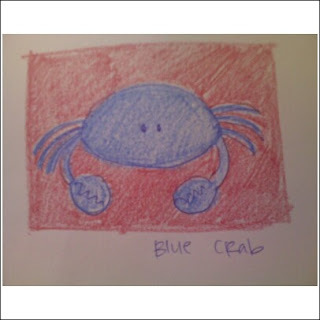 This is my latest crab, the blue crab. He is a land crab...but he's a crab. When I first sketched this little dude, I though that I would put him on a light blue background...then, after coloring his blue body I realized how much better he would look on a bold background...hence the red. Here he is...the Blue Crab...who may or may not be a part of the summer painting list...which will begin production this Sunday night! 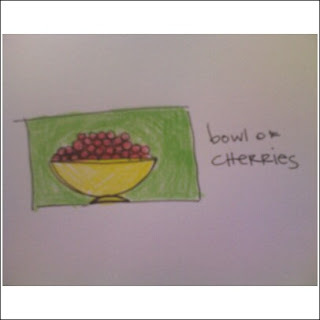 This is a sketch of "Ham and Eggs"
Ham and Eggs came about because a friend of mine from grad school, Hillary, was talking with her step-son about my PB&J painting. He is allergic to peanuts...and thought it would be funny to do Ham and Eggs...since he CAN eat them! 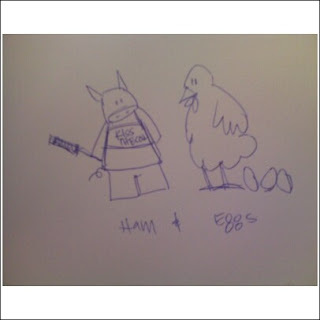 So...here you have it...the sketch for Ham and Eggs....what do you think?